"After the end of the World War of 1914 there was a deep conviction and almost universal hope that peace would reign in the world. This heart's desire of all the peoples could easily have been gained by steadfastness in righteous convictions, and by reasonable common sense and prudence." But we all know that's not what happened. As Britain's prime minister for most of the Second World War, Winston Churchill--whose career had to that point already encompassed the roles of military historian and civil servant with a proficiency in both that few others could claim--had a unique perspective on the conflict, and as soon as he left office in 1945, he began to set that perspective down on paper. To measure the importance of The Second World War, it is worth remembering that there are no parallel accounts from either of the other Allied leaders, Roosevelt and Stalin. We have in this multivolume work an account that contains both comprehensive sweep and intimate detail. Almost anybody who compiles a list of such works ranks it highly among the nonfiction books of the 20th century. In the opening volume, The Gathering Storm, Churchill tracks the erosion of the shaky peace brokered at the end of the First World War, followed by the rise to power of Adolf Hitler and the Nazis and their gradual spread from beyond Germany's borders to most of the European continent. Churchill foresaw the coming crisis and made his opinion known quite clearly throughout the latter '30s, and this book concludes on a vindicating note, with his appointment in May 1940 as prime minister, after which he recalls that "I felt as if I were walking with destiny, and that all my past life had been but a preparation for this hour and for this trial." Their Finest Hour concerns itself with 1940. France falls, and England is left to face the German menace alone. Soon London is under siege from the air--and Churchill has a few stories of his own experiences during the Blitz to share--but they persevere to the end of what Churchill calls "the most splendid, as it was the most deadly, year in our long English and British history." They press on in The Grand Alliance, liberating Ethiopia from the Italians and lending support to Greece. Then, when Hitler reneges on his non-aggression pact with the Soviet Union (the very signing of which had proved Stalin and his commissars "the most completely outwitted bunglers of the Second World War"), the Allied team begins to coalesce. The bombing of Pearl Harbor by the Japanese makes the participation of the United States in the war official, and this is of "the greatest joy" to Churchill: "How long the war would last or in what fashion it would end no man could tell, nor did I at that moment care. Once again in our long island history we should emerge, however mauled or mutilated, safe and victorious." But as the fourth volume, The Hinge of Fate, reveals, success would not happen overnight. The Japanese military still held strong positions in the Pacific theater, and Rommel's tank corps were on the offensive in Africa. After a string of military defeats, Churchill's opponents in Parliament introduced a motion for a censure vote; this was handily defeated, and victory secured in Africa, then Italy. By this time, Churchill had met separately with both Roosevelt and Stalin; the second half of volume 5, Closing the Ring, brings the three of them together for the first time at the November 1943 conference in Teheran. This book closes on the eve of D-day: "All the ships were at sea. We had the mastery of the oceans and of the air. The Hitler tyranny was doomed." And so, in the concluding volume, Triumph and Tragedy, the Allies push across Europe and take the fight to Berlin. President Roosevelt's death shortly before final victory against Germany affected Churchill deeply, "as if I had been struck a physical blow," and he would later regret not attending the funeral and meeting Harry Truman then, instead of at the Potsdam conference after Germany's defeat. Churchill himself would not be there for the conclusion to the war against Japan; in July of 1945, a general election in Britain brought in a Labor government (or, as he refers to them, "Socialists"), and he resigned immediately, for "the verdict of the electors had been so overwhelmingly expressed that I did not wish to remain even for an hour responsible for their affairs." About Winston Churchill (Author) : Winston Churchill is a published author. 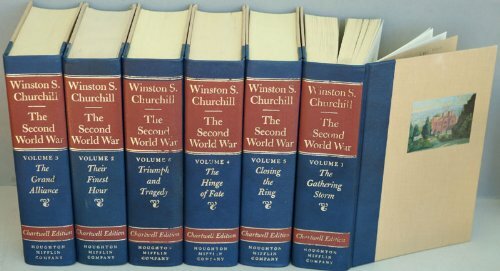 Some of the published credits of Winston Churchill include The Second World War, A Far Country, Volume 1.